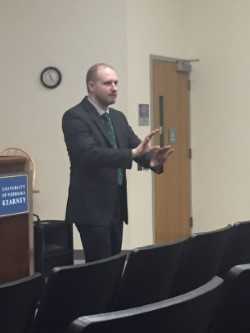 Matthew Dziennik is Assistant Professor of British and imperial history at the United States Naval Academy where his work focuses on British colonial recruitment in the eighteenth and nineteenth centuries. 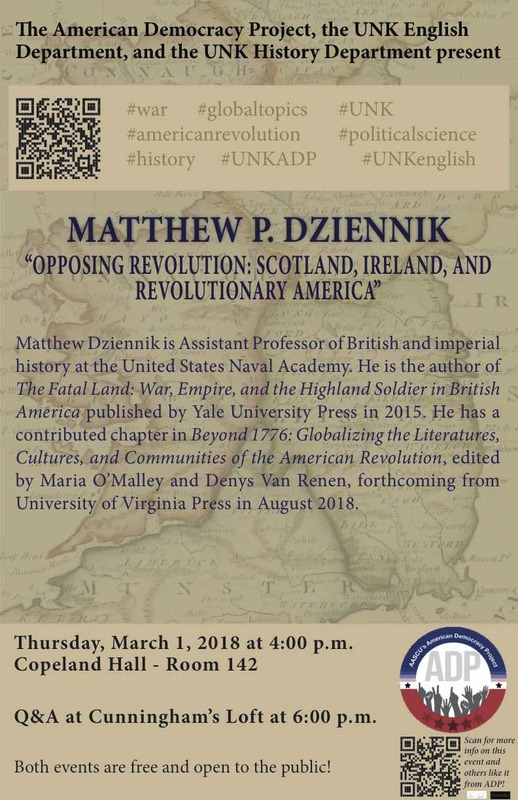 He is the author of The Fatal Land: War, Empire, and the Highland Soldier in British America published by Yale University Press in 2015 and has authored several articles in academic journals. He has a contributed chapter in the edited collection, Beyond 1776: Globalizing the Literatures, Cultures, and Communities of the American Revolution, edited by Maria O'Malley and Denys Van Renen, forthcoming from University of Virginia Press in August 2018. 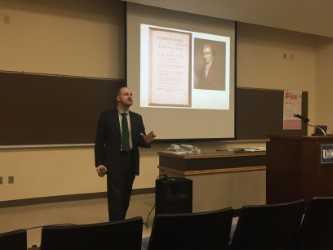 One of the largest fall events that the American Democracy Project hosts on campus is Constitution Day. This event is held each September to recognize the anniversary of the signing to the United States Constitution. 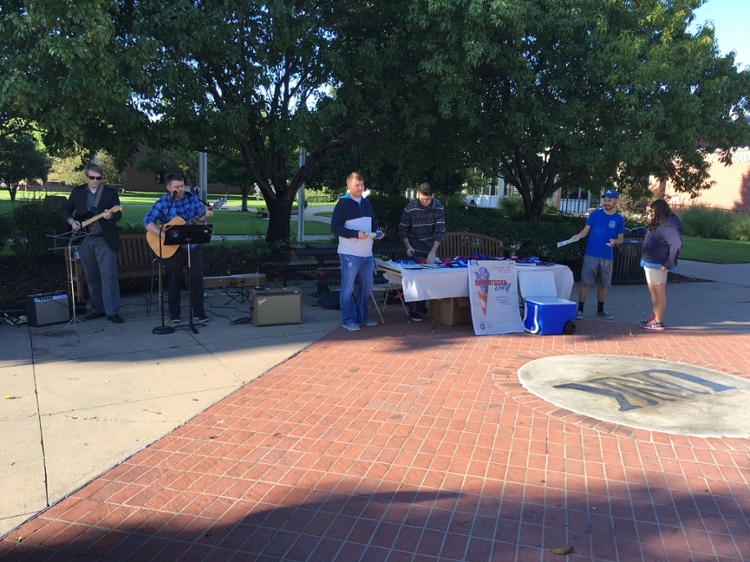 ADP partners with UNK Student Government for this event, and this year "pocket-preambles" were passed out to hundreds of students, despite being moved inside due to rain. Spotlight section of the ADP monthly newsletter and was covered in an article by UNK Communications. ADP Committee members representing the "First Year" program also received good press coverage as Aaron's winning "Talk" received top honors. 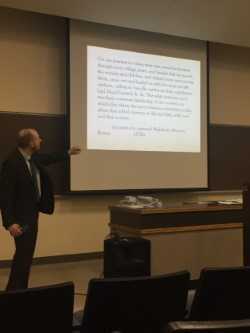 Thanks to UNK American Democracy Project partners and supporters, a guest speaker wrote an article mentioning UNK in the international Arctic Journal. 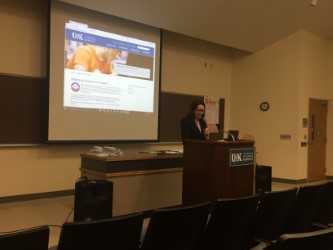 Representatives from the Buffalo County Democratic and Republican Parties gave an overview of the candidates appearing on most central Nebraska ballot tickets. The focus was on regional and state contested ballot items (i.e. not items with only one choice of candidates). The event informed voters about regional races that have not received as much media attention.